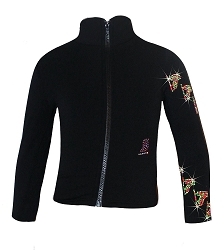 Neon rhinestuds and rhinestones swirls around the right leg in "Spiral Skates" design. Featuring over 800 AB clear rhinestones and neon studs. Available in girls/women sizes in Polartec fleece or Microfiber non fleece fabric. Enjoy ice skating practice and look great on the ice with neon bright ice skating pants by Ice Fire!